The record is made up of 1 item (336 folios). It was created in 16 Oct 1919-28 May 1920. It was written in English and Arabic. The original is part of the British Library: India Office The department of the British Government to which the Government of India reported between 1858 and 1947. The successor to the Court of Directors. Records and Private Papers. Acting Civil Commissioner in lesopotamia. Part 11 concerns British policy regarding the dispute between Bin Saud [‘Abd al-‘Azīz bin ‘Abd al-Raḥmān bin Fayṣal Āl Sa‘ūd, also referred to in the correspondence as Ibn Saud] and King Hussein of Hejaz [Ḥusayn bin ‘Alī al-Hāshimī, King of Hejaz] over Khurma and Tarabah [Turabah]. Much of the correspondence documents the efforts of the British to persuade the two leaders to agree to meet. It is initially proposed that the two should meet at Jeddah; however, it is reported by the Civil Commissioner, Baghdad, that Bin Saud refuses to meet King Hussein at Jeddah, Aden, or Cairo, and suggests a meeting at Baghdad instead. 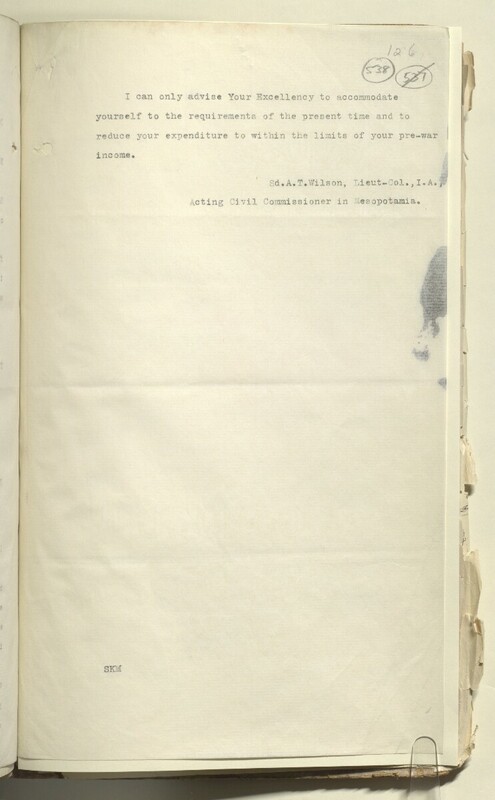 A number of other possibilities are discussed, including the following: the Secretary of State for India's proposal of a meeting of plenipotentiaries, either at Khurma or Tarabah, as an alternative to a meeting between the two leaders themselves; a suggestion by the High Commissioner, Egypt, that the two leaders meet in London; a proposal from Lord Curzon [George Nathaniel Curzon], Secretary of State for Foreign Affairs, that Bin Saud should be induced to meet King Hussein on board a British ship at Jeddah, or, as is later suggested, at Aden. extracts from a report by the British Agent, Jeddah, Lieutenant-Colonel Charles Edwin Vickery, which recounts his recent interviews with King Hussein and the King's son, Emir Abdullah [ʿAbdullāh bin Ḥusayn al-Hāshimī]. Viceroy of India [Frederic John Napier Thesiger].